Prehab (or pre-habilitation) is a proactive approach to injury prevention and reduction. Restorative exercises that focus on postural muscles and developmental movements. Optional INTAKE + (Intake with one additional “learn by doing” session to be scheduled soon thereafter). Required to have taken INTAKE prior to taking Movement 101. Emphasis is on empowering you with the ability to perform your recommended routines successfully. Q & A. Detailed answers to your movement and training questions. Small classes mean more individual attention. Movement 101: Requires 2 – 4 people per group for class to be conducted. Required to have taken INTAKE prior to taking any Training. Training builds upon your recommended routines and Movement 101. Your phase of training will be relevant to your needs and intended results. All to support you in feeling, moving, and performing better whatever your demands are. Optional Performance and Restorative Training. UpRight Movement is Veteran founded, and supports all Military service personnel by offering a 20% discount on all of our services. All Active, Reserve, Former, and Retired Military service personnel are eligible. 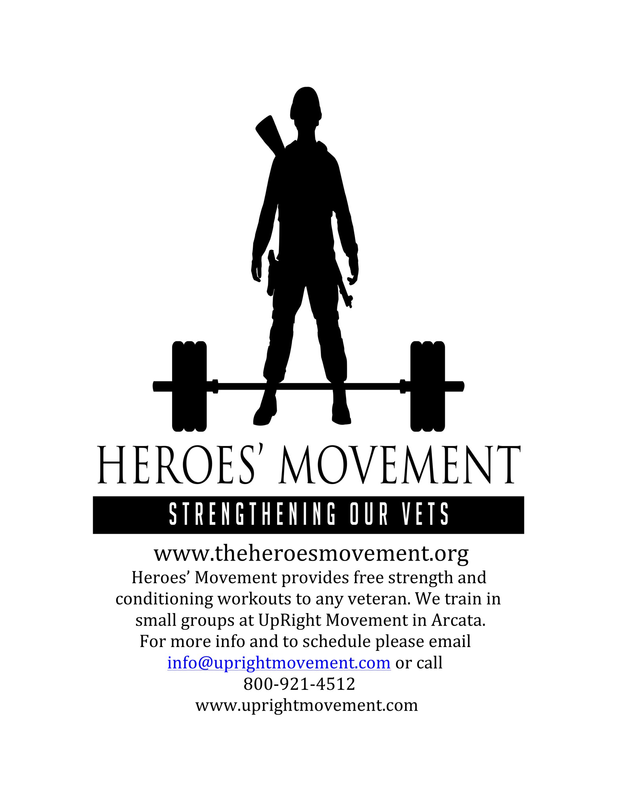 Also, Free small group training for Veterans, 2 – 4 people is provided through our Heroes’ Movement partner. Contact UpRight Movement and present valid military I.D. and/or DD Form 214 in order to receive discount code. Payment/Cancellation Policy: Applicable payment is due at the time of any appointment scheduling, and cancellation must be made at least 24 hours prior to appointment to avoid full charge. There is a $25 returned check fee. Schedule, Rates, and Offers subject to change. Offers limited to one with all other sales, and excludes workshops. The why, how, what and when of recommended routines. We will be practicing essential patterns with a focus on function and feeling better. UpRight Movement has helped me regain strength and balance in areas that have been affected by post polio syndrome. They have designed an individualized program that involved dynamic, varied exercises, which engaged my entire body. UpRight Movement took into account my physical challenges and presented appropriate exercises that pushed my boundaries. Over time, with this approach, I gained a renewed confidence in my body’s capabilities and potential. If you have already filled out the Registration Form and signed the Medical Waiver, please sign in here.